One great thing about using WordPress is that you can never run out of themes you can use for you blog both free and paid. Indeed, WordPress has proven time and over again to be not only one of the easiest blogging platforms but also most popular Content Management System (CMS) in recent times. Most of the world websites are powered by WordPress.One great thing about using WordPress is that you can never run out of themes you can use for your blog both free and paid. Indeed, WordPress has proven time and over again to be not only one of the easiest blogging platforms but also most popular Content Management System (CMS). The number of both free and premium WordPress themes coming out everyday is increasing with the popularity of WordPress. You can find thousands of free responsive WordPress themes but it is always hard to find the quality ones. The themes in our list are ideal for bloggers in various niche, hobbyists, news and journal website and for personal blogs. We also include eCommerce theme. The number of downloads this theme is getting everyday is what captured our attention to this awesome free WordPress theme. On average, it is downloaded more 900 times every day which shows its popularity and usage. Spacious is a multipurpose theme. It can be used for various type of websites, whatever your need is, be it designing a business website, a blog, portfolio, or news website, this theme has it all. Spacious like the name suggest gives more space for content and more space between various sections. It is a 2 page template, with 4 page layouts, 13 widget areas, 4 blog display types, 5 custom widgets focusing on business template, primary color option to match your logo, awesome slider. It also has website wide and boxed layout, dark and light color skin, and built for all languages. ColorMag WordPress theme is another free theme that is making waves in 2016. 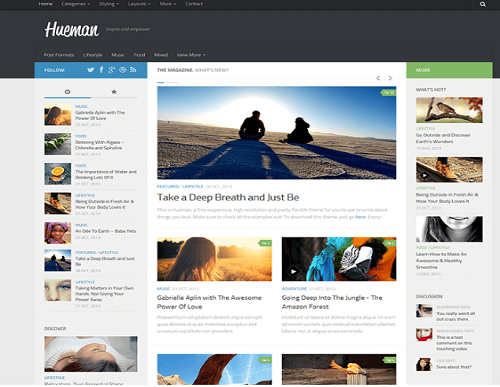 Many popular news websites are making use of different versions of this theme. It look modern and intuitive, crisp, beautiful, polished and very well-organized. There are different colors you can use for different categories feature available in this theme. 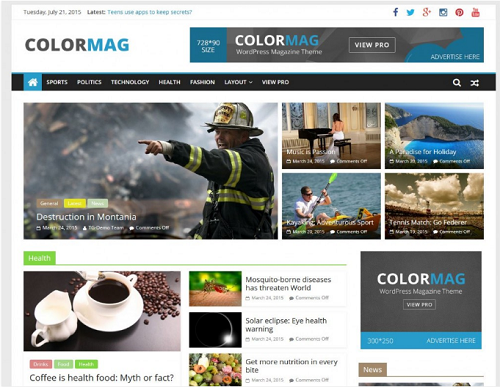 Colormag is best suited for newspaper, news, magazine, publishing, business and other types of websites. It has a responsive layout and attractive designs. Colormag without a doubt can effectively compete with any premium magazine style theme, but the best thing is that you are getting this theme for free. If you are looking for a perfect magazine style free WordPress theme for your website, Colormag is the way to go. Are you thinking about making use of WooCommerce in your website? 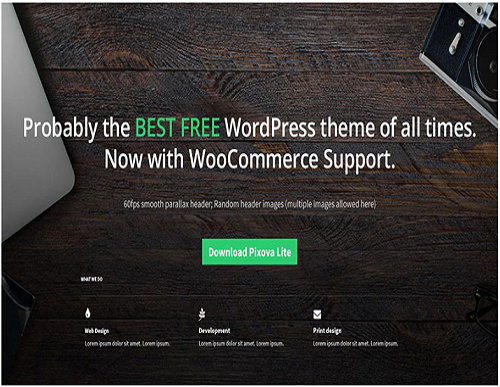 This free WordPress comes with WooCommerce support. Although you are likely to get more awesome features unlocked when you get the premium version. It very responsive and works well in all device. It provides your site with a nice-looking parallax header that is automatically inserted upon installation. With this type of header, you can easily get the attention of users who visited your website. It also makes it easier for WooCommerce integration. You can easily talk about your product and send your site visitors where to purchase the item in eCommerce area. Pixova Lite is structured as one page layout them. It has a portfolio module for featuring your best work in previous times. Your site visitor will see animation upon scrolling over one of the project thumbnails and see additional information when they click on the image. You can improve your SEO with this free WordPress theme. It also gives you an opportunity to give away free resources to your site visitors. This theme is indeed awesome and you don’t have to pay to get it now. 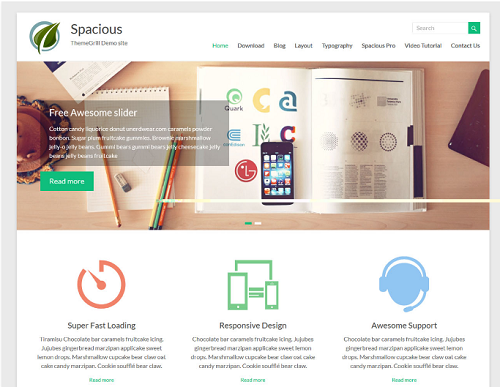 Accelerate is one-of-a-kind free WordPress theme and one of the best theme for 2016. It is a multipurpose theme that you can use for any website and for any purpose. The simplicity and ease-of-use of this free WordPress theme is what captured our interest. It is also very responsive and designed to make your site awesome. It comes with both wide and boxed layout, homepage slider, primary colors. You can put any content you want in the content area and highlight it with the widgets of your choices. Accelerate can compete with any premium theme. It is perfect for your Google adsense. It will definitely make your website to stand out. 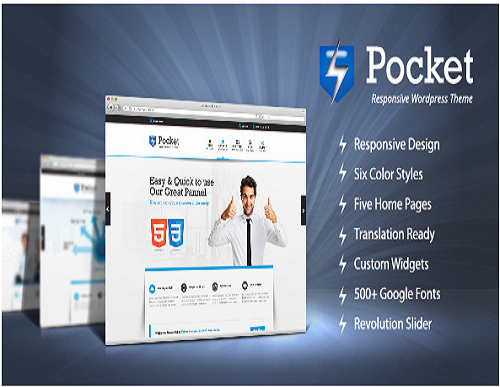 Pocket is a multipurpose premium WordPress theme designed by themeforest. This theme is responsive, fast and very clean WordPress theme for business, blog, portfolio or company website. It looks very professional and makes your site stand out. It has a 5 homepage styles which come with the theme and help you to build your pages easily. Some other features of Pocked Responsive WordPress theme includes Static menu, revolution slider, contact form 7 support, mobile-friendliness and great interface to give your users absolute user experience. 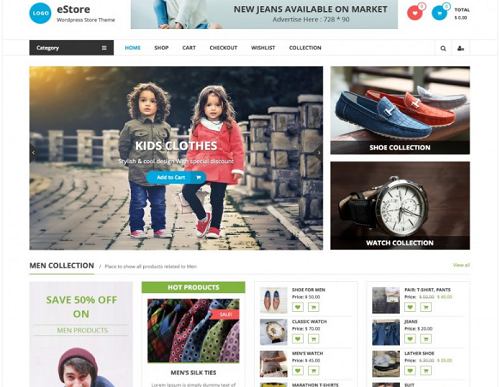 One of our most favorite free WordPress theme for eCommerce owners is eStore. This free WordPress theme makes your site stand shoulder-to-shoulder with those ecommerce site built with thousands of dollars. This theme is one of the unique and newest theme to come with WooCommerce support. With a fast WordPress hosting , this theme is sure to help you make a lot of money with your online store. It gives you freedom to showcase your featured products, most selling items, products category and even hot-selling products. eStore is on the level of its own. It looks beautiful, modern, crisp and responsive. You can actually use this theme for other purposes as well if building eCommerce store is not your thing. 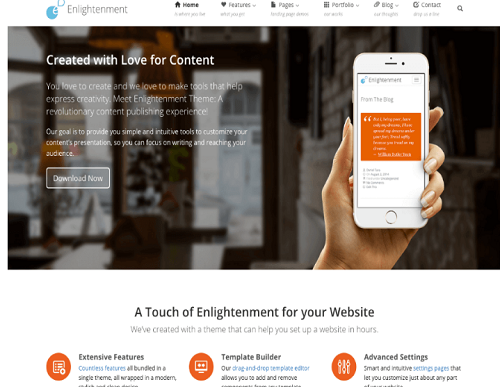 Enlightenment is beautiful, modern-looking multipurpose theme with clean elements and lots of white space to insert most of the focus on your content. This theme is really awesome, it is very responsive, infact the whole modules will snap into place as s customer is going through your content from mobile device. You can easily present a photo on your homepage with the featured image header, you can as well add custom background and colors to help you with branding. No need to know a single line of coding before using this theme, it is very simple and very easy to use. It comes with up to 4 columns, sidebars and widgets to help you with customization of your website. The maker of this theme understand that your page speed matters a lot, therefore this theme is lightweight and loads very fast. Hueman is one of the most popular WordPress themes that you can install directly from the WordPress theme library. This theme is clean, fast and highly optimize. Built for different users, it works well for blogs and magazines. Hueman comes with header and footer for placing your widgets without any trouble. It has about ten post formats to add variety to your website as your visitor go through your contents. Your site will definitely look beautiful with unlimited accent colors. If your website caters for multiple languages, this theme has option to translate your content to various popular languages. In addition, it comes with a great tool for uploading your logo and threaded comment to make your blog lively. There are lots of free WordPress themes you can find online today, but most of theme don’t really work great, this list above will help you select the best WordPress theme to make your blog stand out. Bear in mind that your page speed and hosting of your website affects your overall Website/blog performance. Check your website across all devices and browsers anytime you install new themes. These really are some of the best WordPress themes. They look fresh and all of them have a different feel about them. I hate it when I see several themes that I fancy. It’s hard making the choice!